WELCOME HOME – The Edmonton Oil Kings have played half as many games at home (9) than on the road (18) entering tonight’s game vs. the Prince Albert Raiders. Their .667 win percentage on home ice is second in the Central Division only to the Red Deer Rebels (.750, 9-3-0-0). The nine games played at home by the Oil Kings at this point of the season are tied with the Kamloops Blazers for a league low. 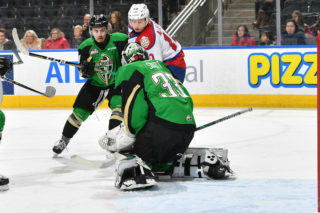 Wednesday marks just the second home game that the Oil Kings have played this month, with their 3-1 loss to the Lethbridge Hurricanes on November 17 snapping a three-game home winning streak. Edmonton will play a total of just three games at Rogers Place in November. 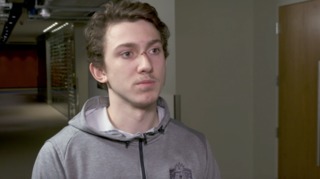 FIRST GOAL WINS? 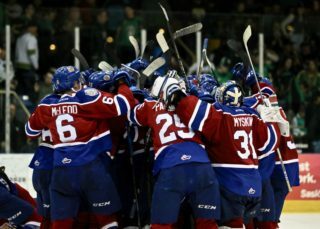 – The Oil Kings have scored the first goal of the game in 15 of their 27 games played this season. They are 12-1-1-1 when scoring first, having suffered their first regulation loss of the season when potting the game’s first goal against the Kelowna Rockets last Saturday. They are 2-8-1-1 when surrendering the first goal. 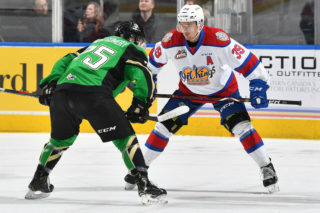 QUEST FOR THE THRONE – Oil Kings captain Trey Fix-Wolansky and Raiders forward Brett Leason enters Friday’s action as the WHL’s top two point scorers. Leason (26G, 30A = 56 points in 25 games) leads Fix-Wolansky (15G, 37A = 52 points in 27 games) by just four points in the scoring race; Leason leading the League in goals, Fix-Wolansky leading the WHL in assists. Fix-Wolansky just saw an 11-game point streak (7G, 21A = 28 points) come to an end on November 16, while Leason is riding a season-long point streak of 25 games (26G, 30A = 56 points). FILLING THE NET – The Raiders and Oil Kings enter Wednesday’s contest as the top two scoring teams in the WHL with 123 and 104 goals scored, respectively. The only other teams in the CHL with more goals than the Oil Kings are the OHL’s Ottawa 67’s (117 goals in 28 games), Sarnia Sting (106 in 26), Sault Ste. Marie Greyhounds (105 in 26), and the QMJHL’s Baie-Comeau Drakkar (118 in 27), Moncton Wildcats (118 in 27), Rouyn-Noranda Huskies (115 in 26), Drummondville Voltigeurs (114 in 25) and Sherbrooke Phoenix (105 in 26). 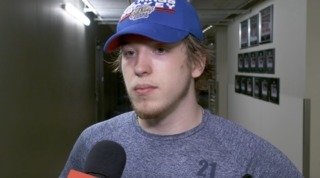 IN THE SPOTLIGHT – Six Oil Kings players were featured in the latest NHL Central Scouting ‘Players to Watch’ List for the upcoming 2019 NHL Draft, released last Thursday. 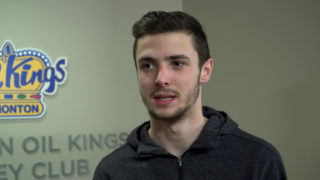 The Oil Kings led all WHL teams with six rated players (A – Matthew Robertson; C – Jacson Alexander, Vladimir Alistrov, Brett Kemp, David Kope and Boston Bilous). They are one of just two teams in the League to have each a forward, defenceman and a goaltender make the list.